Not everybody can be an astronaut or a superspy, but the 2015 Chevrolet Corvette probably gets you as close to that feeling as possible. Powered by a direct-injection 6.2 liter V-8 engine that delivers 455-horsepower, the Corvette buries the needle in thrillpower. The 2015 Chevrolet Corvette - for sale in Springfield - is the undisputed king of the American sports car. 2015 Chevrolet Corvette reviews will undoubtedly enthuse over performance and control. The Corvette's wide athletic stance is augmented with four-wheel independent suspension and electronic stability control for authoritative handling. Choose from the seven-speed manual or available eight speed paddle-shift automatic transmission. 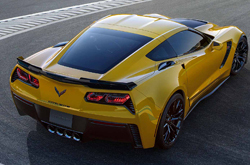 In any form, the 'Vette will crush the curves and scorch the straightaways. Inside, the Corvette is well-appointed. Premium materials abound. The new GT seats are supportive and comfortable enough for long rides. The 2015 model supplies ample leg and headroom for tall drivers. The new Corvette comes with rear vision camera on all models. The theft-deterrent system, vehicle, push button start, immobilizer and audible visual alarm are standard equipment. Frontal and side-impact airbags for driver and passenger include the passenger-sensing system. The bounty of technological conveniences will be mentioned in the 2015 Chevrolet Corvette reviews. The 8" diagonal color touch-screen, Bose premium 9-speaker system, streaming audio for music and select phones; Pandora, TuneIn radio, Stitcher and Siri Eyes Free for compatible smartphones are standard. Included is a three-month all-access trial subscription to SiriusXM Satellite Radio. All models are also equipped with the OnStar Directions and Connections plan for 6 months, including Automatic Crash Response, Stolen Vehicle Assistance, Roadside Assistance and Turn-by-Turn Navigation. The Corvette is the whole package. Even if you were an astronaut or a superspy, what would you do but buy a Corvette? Why not skip all that and get right to the thrills? Continue reading our review below, or see the 2015 Chevrolet Corvette in Springfield at Reliable Chevrolet. When you compare Chevrolet's new 2015 Corvette head-to-head with the 2015 Nissan GT-R, BMW M3, Ford Shelby GT500 and the Dodge SRT Viper, we're sure you'll learn that the Corvette is an ideal fit for you. The Corvette's handsome looks, advanced cabin features and low cost are sure to win over Missouri shoppers. It's a fantastic value, which you'll certainly see when comparing its price to the vehicles in its class. Browse our bullets for more details about what it offers! 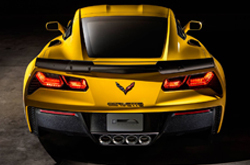 Thank you for selecting Reliable Chevrolet as your source for 2015 Chevrolet Corvette reviews. We stand out from other dealerships by offering reviews designed to assist you in your vehicle search. Make informed decisions when it comes to your next auto purchase - don't take guesses! Each overview is stuffed with facts and vehicle features in a layout that's easy to understand. 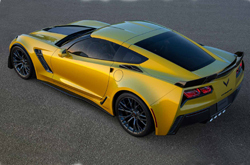 Please visit our Chevrolet review and compare archive if you feel the Corvette is not right for you; there you&ll learn about Reliable Chevrolet's entire lineup.